Looking for some good desktop/shell replacement programs for Windows? For those of you who feel the need, the need to customize, an alternative shell to the Windows shell is one possible solution. So what exactly is a shell replacement? It’s basically a program that will integrate with Windows and replace the default shell. The shell is GUI interface that you use to run programs or view files, etc. By replacing the shell, you can completely change the look and feel of the GUI. Usually when replacing the Windows shell, users are looking for more control and customization options than what is provided in Windows. Also, a lot of shells end up using less resources than the default shell. There used to be a lot of different shell replacement programs out there, but for whatever reason, almost all have stalled development. Instead, it seems nowadays there are more desktop customization utilities than shell replacements. I’ll also mention some of the most popular programs for customizing the Windows 10 GUI. In this article, I will list out active and stalled projects that are the best replacement shells for Windows. All of the shells are easy to uninstall if you don’t like them, which is good. CarioShell is the only modern looking and active Windows shell alternative that allows you to access your files and programs faster from the desktop. It kind of makes your Windows desktop look more like the Mac OS X desktop. It’s not highly customizable or anything like that, but it does give your desktop a unique look. Classic Shell was active till the end of 2017, but the developer has stopped working on it after 8 long years. Hopefully, someone picks it back up for him because it’s definitely one of the better shell replacements. As the name suggests, it can give Windows that classic look from older versions. It’s also highly customizable, which is kind of the point if you are replacing your entire Windows shell. Since the last stable release was just in 2017, it still works fine in Windows 10, 8, 7, etc. Emerge Desktop was probably one of the most popular Windows replacement shells out there before it stopped developed in 2015. It replaces Windows Explorer, the taskbar, the start button and pretty much everything else. Another good shell alternative is Sharpenviro. It works on Windows XP, Vista and 7. You can create multiple toolbars that are similar to the Windows taskbar, but you can customize them and they can also include real-time info like monitoring CPU, taking notes, getting weather reports, etc. You can also customize pretty much everything, which is the hallmark of a good shell replacement program. Sharpenviro also supports multiple monitors, which is essential nowadays since a lot of people have more than one monitor. You can also create virtual desktops to manage your desktop windows. LiteStep was another awesome replacement desktop for your Windows PC. Just install it and then start installing themes, scripts or modules. You can customize your desktop in a multitude of ways and it’s all open source and free. Using LiteStep with some of the modules requires a little more technical experience than some of the other programs, but it can do just about anything you want if you get into it. LiteStep has been around for a very long time and the latest release was in 2011, so quite a while back. It’s probably not going to work with Windows 10. However, the themes and modules are still being updated/created by users. Talisman Dekstop is a commercial shell replacement that has a good number of themes you can download to fully customize your desktop environment. 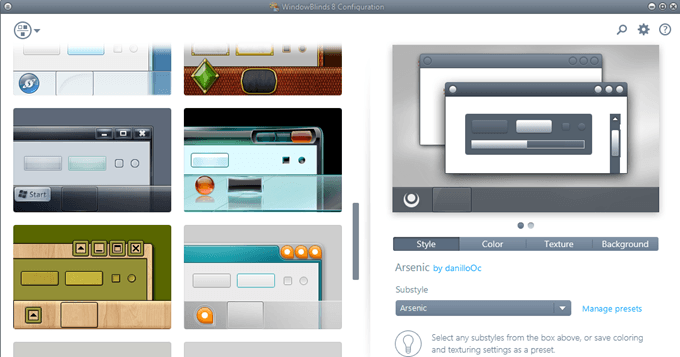 You can create multilevel desktops, desktop panels, and lots more. With a little bit of self-learning, you can customize the taskbar, system tray, clock, start menu, explorer interface, etc. Only works up to Windows 7. AstonShell is definitely not my favorite shell replacement program, but it might be great for some! If you really liked specific themes like Christmas or Disney, etc, then you can use AstonShell to download all kinds of crazy themes and convert your desktop into whatever you like. It’s definitely not for those who want a minimalistic look or a modern look. Also, AstonShell is not free, so you’ll have to cough up $30 if you really want to convert your desktop into something crazy. Also, it hasn’t been updated since 2010, which is eons ago! For those of you who like the minimalistic look for your desktop, bbLean is a good choice. It hasn’t been updated since 2009, but a lot of people still love using it because of the simple GUI interface. But just like with most shell replacement programs, new themes are always being created. As you can see, there aren’t many active shell replacement programs left out there. Instead, there are still a decent number of desktop customization tools. These programs let you change the look and feel of the desktop, taskbar, start menu, etc., just like a shell replacement. One of the most popular desktop customization tools is Rainmeter. Rainmeter is open source and has a very active developer community. It basically lets you display customizable skins on your desktop that can include pretty much anything. Another popular set of customization tools is from a company called Stardock. One utility they sell is WindowBlinds. This program will let you add customized skins to your desktop windows. You can then add backgrounds, textures and colors to the skin. You can adjust the fonts and create your own skins too. They also have other customization software like Start10, Groupy, Fences, Tiles, etc. Those are probably the two most popular Windows customization tools that are still actively developed. Overall, there aren’t a lot of shell replacements or desktop customization programs out there, which makes choosing one a bit easier. If you are using a Windows shell replacement program that I haven’t mentioned here, feel free to let us know about it in the comments. Enjoy!